Due to rising energy costs, limited resources and climate change, the energy efficiency of industrial products is becoming more and more important. To remain competitive, machinery and equipment must be designed and operated energy efficient. An increasing share of electrical devices uses power converters to adapt the amplitude, waveform, type (AC, DC) and frequency of voltage. In addition to the established concepts new circuit topologies and semiconductor technologies are increasingly used in order to obtain highest efficiencies. However, access to these new procedures is still difficult and unclear, because recognized design methods are missing. In addition to conduction losses and switching losses in power semiconductor devices, the core losses of magnetic components play a crucial role and have to be considered for loss minimization. It is important to minimize these losses by skilful choice of circuit topology, the switching strategy and by optimal selection of semiconductor technology. 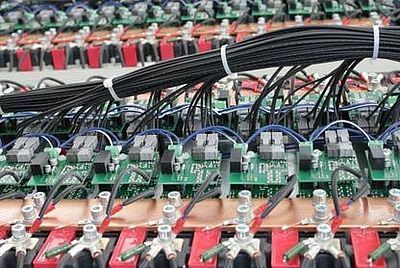 In case of hard switching the switching losses can be reduced by 50% due to the use of SiC power semiconductors. Alongside size, weight and cost also must be considered. The aim of the project "Effiziente elektrische Konverter" is the development of a design environment for power electronics, which provides the necessary tools for optimization in terms of efficiency, power density and dynamics.